The Rupes Big Foot Detailing Belt places all of your polishing supplies within arms reach. This comfortable belt is loaded with various pouches, straps and pockets to carry your favorite pads, polishes and detailing tools. Save time, increase production and enhance your convenience with the Rupes Big Foot Detailing Belt. One of the most time consuming aspects of paint polishing is scurrying around your garage or shop, looking for the correct polish, pad or tool. Luckily, Rupes has included a compartment for all of them! The Rupes Big Foot Detailing Belt saves time by putting the products you need at your finger tips. 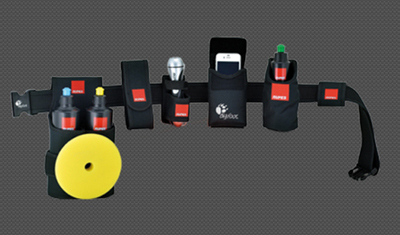 This high-quality utility belt has been as carefully engineered as all of Rupes' products. The Rupes Big Foot Detailing Belt is fully adjustable so one size fits all. A large pocket holds two bottles of polish and unique Velcro strap allows you to attach a polishing pad. Several tool pouches hold things like inspection lights, pad brushes, polish bottles, microfiber towels and more. There is even a thick pouch designed to safely secure smart phones. The Rupes Big Foot Detailing Belt is the good-looking, superhero-like way to detailing convenience.